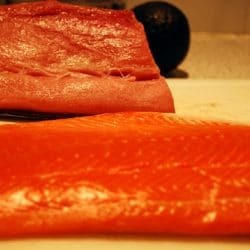 The question of what is sushi grade fish comes up a lot and no one seems to accurately answer that question. After some research I am now able to provide information as to the guidelines and regulations that are followed in the seafood industry in terms of serving raw seafood. As for micro standards for sushi or sashimi grade seafood, I have spoken with many in the seafood industry who supply ‘sushi grade’ fish for sushi and sashimi served at restaurants and they all give me the same answer… they do not know of any regulations from either the FDA or any other agencies regarding ‘sushi grade’ seafood, which is why suppliers have set up their own micro and chemical parameters for their products. A personal search of FDA documents turns up the same results, no clear standards as to what makes fish ‘sushi grade’ or ‘sashimi grade’ and no definition of the term. The only concern any inspectors have is referred to as the parasite destruction guarantee, which is accomplished by ‘freezing and storing seafood at -4°F (-20°C) or below for 7 days (total time), or freezing at -31°F (-35°C) or below until solid and storing at -31°F (-35°C) or below for 15 hours, or freezing at -31°F (-35°C) or below until solid and storing at -4°F (-20°C) or below for 24 hours’ which is sufficient to kill parasites. The FDA’s Food Code recommends these freezing conditions to retailers who provide fish intended for raw consumption (for further information, please visit the FDA website). Some exceptions to that rule are bluefin tuna, yellowfin tuna, and farmed salmon. I know that is a mouthful, but it’s the facts. Other than a few specific organisms of concern for some seafood, sashimi standards are set as any other ready-to-eat item, e.g. sushi. This means that, aside from the FDA recommendations and local Health Department requirements, there are no laws or recommendations for “sushi/sashimi grade” fish. It is no more than a marketing term. As for those on the serving side, their main concern seems to be with the seafood vendors. Many of them will declare that the products they provide are “sushi/sashimi” grade but with no standards to back up those claims. In the U.S. parasite destruction is required for those species where that hazard is identified but you’ll find that most chefs will claim that they use “fresh” salmon and other products. This may be because they do not know, perhaps it is delivered thawed by the local supplier (who may or may not have frozen it according to the requirements), or they may even use fresh, never frozen, salmon. The term “fresh” for sushi fish has been linked to higher quality in the minds of many consumers and therefore the restaurants use this as a selling point even though the product may have been previously frozen (usually aboard the fishing vessel) and serving certain species without proper freezing is against regulations. Sushi rice is another critical part of sushi preparation, for many reasons. Many sushi restaurants use acidification as a control but the final sushi products must be cooled to below 40F before put onto display in a self-service case (in the case of supermarkets, et. al.). However, sushi restaurants do not cool the items before serving to customers since such a short time lapses between preparation and consumption. Once the rice is acidified, time is not used as a control and therefore it can be stored at room temperature where the quality is best and it is also easiest with which to work. As you can see, there are many issues that affect the quality of the sushi served in restaurants or as ‘ready-to-eat’ meals. But with no federal regulations, it’s all about practical standards and health code restrictions. When you eat sushi from a quality establishment, you may expect that the FDA requirements for parasitic destruction have been followed, however you are at the mercy of the preparer to make sure that subsequent to being frozen and thawed, your food has been handled properly. On the whole, I don’t worry. But I also don’t eat anywhere that seems like they may not be devoted to proper sanitary standards. Good sushi is, in my opinion, well worth the minimal risk.